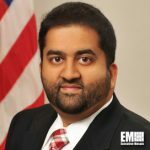 Ahmed Haque serves as the director of the Office of Programs and Engagement in the Office of the National Coordinator for Health Information Technology‘s. He leads efforts to drive adoption of interoperable health IT in the U.S.
His work at the Department of Health and Human Services agency also covers the reform of the health service delivery system, including technical assistance development, learning and education programs and resource dissemination. He previously served with the National Quality Forum as program designer and subject matter expert on health informatics standards. Haque has also worked on health services research on healthcare policy with the American Hospital Association and founded the IT startup company Reviving Styles.